The war would quickly come to an end in just over one with the surrender of General Lee at Appomattox on April 9, 1865. Though other theater generals would surrender later and some seafaring Confederate captains would capitulate even later in the year, the surrender of Lee is generally considered the end of the Confederacy. The men of the 48th PVI sense the end is near and as is documented, none wanted to be the last man to die in battle. 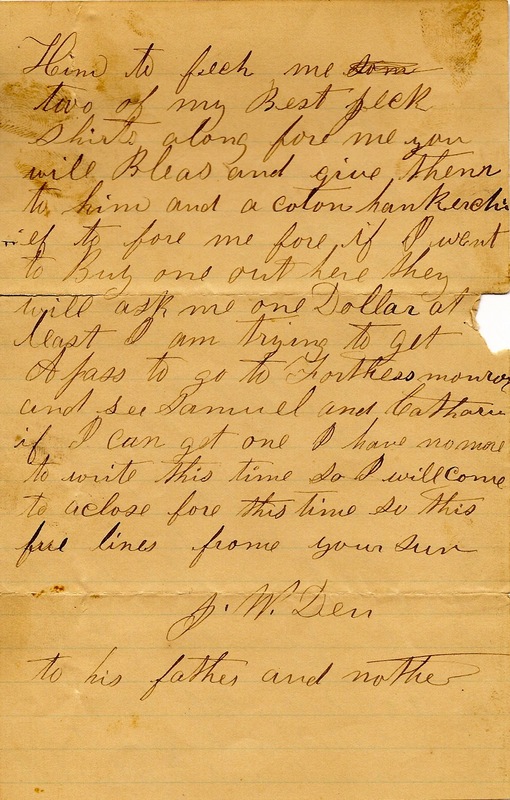 The letter of March 6, 1865 shows a more casual John, which him sending money home with a friend Franklin Hoch and with him requesting more clothing for him to have handy and at the ready. He even describes the need for handkerchief from home so that he doesn't have to pay the sutler the outrageous price of $1. 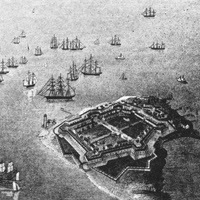 Lastly, he describes that he is seeking a pass to see his sister Catharine and her husband Samuel who is stationed at Fort Monroe. Frequently, wives would accompany their husbands in the field, providing cooking, cleaning and support to the troops. There are only four more letters in the portfolio of "The Letters of John W. Derr". Soon I will be closing this segment of the blog and continuing with more general information. I am open to suggestions and hope that you have enjoyed them so far. I take my pen in hand to inform this few lines to you to let you know that I am well at present time and I hope that this few lines will find you in the same state of good health. I received your letter the other day and I was very glad to hear from you and to hear that you was all well at the same time. I let you (know) that Franklin Hoch is gone home on furlough and I did send $50 dollars home with him. It was in a 50 dollar bill. Let me know whether he gave it to you or not and I also told him to fetch me two of my best jeck (sack) or (checked) shirts along for me (if) you will please and give them to him and a cotton handkerchief too for me for if I went to buy one out here they will ask me one dollar at least. I am trying to get a pass to go to Fortress Monroe and see Samuel and Catharine if I can get one. I have no more to write this time so I will come to a close for this time. So this few lines from your son. What ever happened to the last of the letters? I really enjoyed the journey, I hope you finish it. Just a Jen...You are correct. I got very busy in my daily routine and neglected to finish with the last four letters. I also neglected to summarize his overall history post-war. You have motivated me to complete the journey and I will do so soon. Thanks for the push! Capt William W. Potts..oddly, I cannot locate any images of him..can you recommend any ? 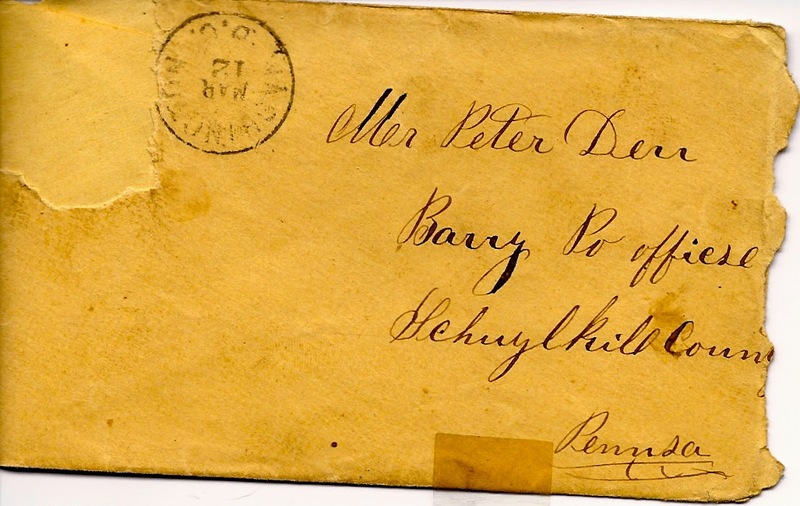 Sadly, we only have one of his letters, written to his brother in 1862. I apologize for the delay in response. I am thrilled hear from one of the ancestors of my GGGrandfather's regiment. 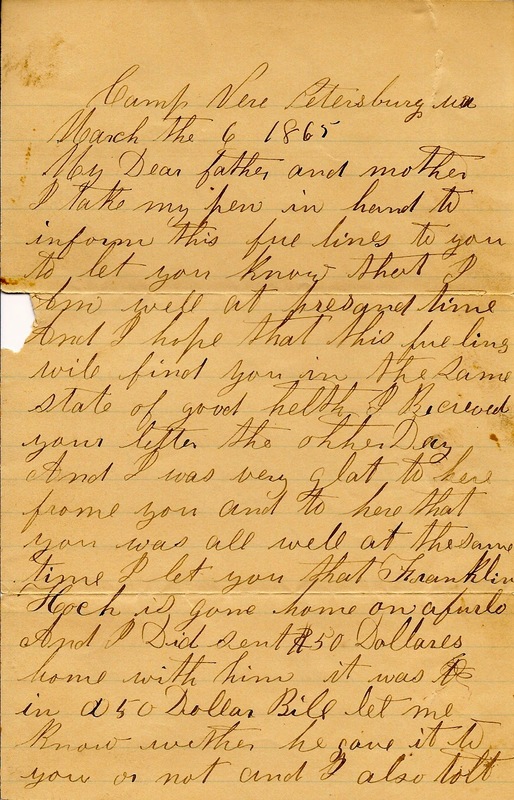 If you look at the original photocopies of the letters in this blog, you will see references to Capt Potts in the address that JWD references for his parents to write to him. I do not have a photo of Potts, but will look to see if I have any references anywhere. I do owe this blog reader group the last few letters. I stopped last year during a busy time and I still need to publish the last of them. Keep in touch brother!